Reading pays author, Chris Grabenstein, entertained kids around St. Louis this week with stops at two elementary schools and Buder library. Take a look at the fun below and keep an eye out for our next Reading Pays program in Fall 2016! Kids at Ames Visual and Performing Arts School had their books signed by Chris Grabenstein before posing for a photo. Before asking patrons to solve puzzles, Chris Grabenstein spoke to fans about the many state awards Escape from Mr. Lemoncello’s Library has won. The book is up for this year’s Mark Twain award in Missouri! There was a packed house at Buder Library for Grabenstein’s visit. Reading Pays — Pass it On may have ended in October, but it’s not too late to get in on the fun! Visit your favorite library to check out a copy of Savvy or its sequels Scumble and Switch. Keep an eye on the blog, or SLPL’s website for the announcement of our upcoming Spring 2016 Reading Pays book! Author Ingrid Law’s book, Savvy, has been chosen as the fall 2015 Reading Pays—Pass It On! title. Kids in Grades 3-6 can get a FREE copy of Savvy at any St. Louis Public Library location beginning September 15 (while supplies last). In Savvy, Mibs Beaumont is turning thirteen and will soon learn what superpower—her “savvy”— she will receive. With one brother who causes hurricanes and another who creates electricity, it promises to be outrageous… and positively thrilling. Just before her big day, Poppa is in a terrible accident. Suddenly, Mibs’s dreams of x-ray vision disappear like a flash of her brother’s lightning. She sneaks a ride to the hospital on a rickety bus with her siblings and the preacher’s kids, but when the bus starts heading in the wrong direction, only one thing is certain: this bus trip will change their lives. Law has written two other novels for young readers: Scumble (sequel) and the newly released companion novel, Switch. If you’re in Grades 3-6, pick up your FREE copy of Savvy. Don’t forget that Reading Pays—Pass It On! When you finish reading the book, pass it along to a friend. Be sure to post comments about Savvy here! Meet author Ingrid Law at Schlafly Branch Library on October 28th at 6:30 p.m. and have her sign your copy of Savvy! 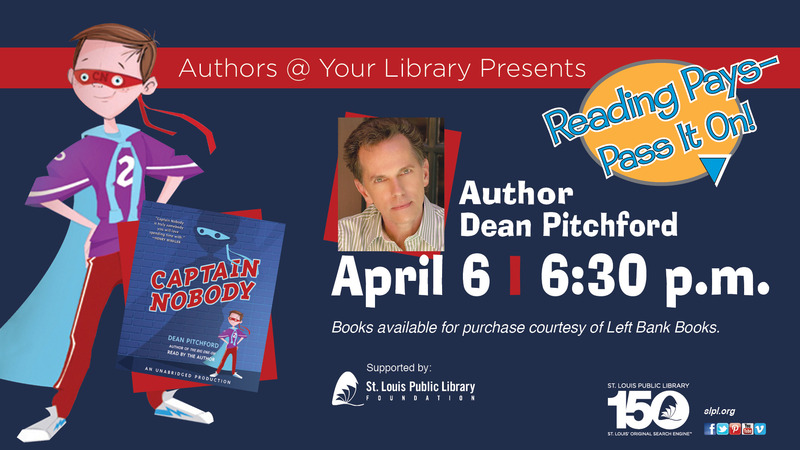 If you’re in grades 3-6 you can pick up your FREE copy of Dean Pitchford’s Captain Nobody at any St. Louis Public Library location (while supplies last). After Newt Newman’s football-star brother is knocked into a coma during the biggest game of the season, Newt’s best friends keep his mind off of the accident by helping him create the ultimate Halloween costume. Don’t forget that Reading Pays—Pass It On! When you finish reading the book, pass it along to a friend; and be sure to visit Central Library on April 6 at 6:30 PM to meet author Dean Pitchford! Meet Reading Pays author Kate DiCamillo! Kate DiCamillo will speak and sign books at Central Library on Saturday, October 25, 2014 at 11 a.m. Books will be available for purchase from Classroom Library. Kate is the St. Louis Public Library, Reading Pays, author for fall 2014. Children in grades 2-3 may pick up a FREE copy of DiCamillo’s book, Bink & Gollie, and those in grades 4-5 may receive a FREE copy of The Magician’s Elephant from any St. Louis Public Library, while supplies last. Books will be available at all SLPL locations late next week, drop by to pick up a copy after Sept. 20th! Kate DiCamillo has been named the 2014-2015 National Ambassador for Young People’s Literature by the Library of Congress to raise awareness of the importance of literature in promoting lifelong literacy and education and to improve the lives of young people. DiCamillo is the 2014 recipient of the Newbery Medal for her latest book, Flora & Ulysses: The Illuminated Adventures. The author is no stranger to the Newbery, which is awarded annually by the Association for Library Service to Children, a division of the American Library Association, to the author of the most distinguished contribution to American literature for children. She also won the Newbery Medal in 2004 for The Tale of Despereaux: Being the Story of a Mouse, a Princess, Some Soup, and a Spool of Thread and a 2001 Newbery Honor for her first published novel, Because of Winn Dixie. 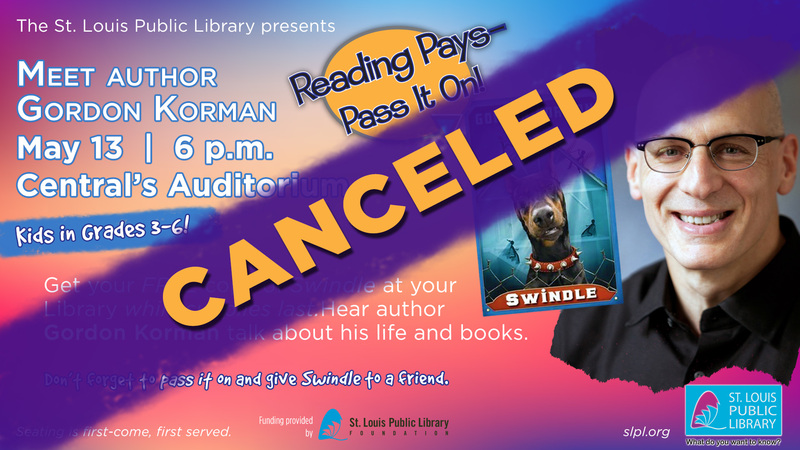 The Reading Pays program with author Gordon Korman scheduled for tonight at Central has been cancelled. Mr. Korman’s flight out of Chicago was cancelled because of the severe storms and tornado warnings last night. The earliest available flight would have gotten him to St. Louis this evening—well past the scheduled program time. We are investigating the possibility of re-scheduling, but do not have a new date at this time.